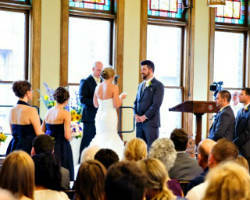 Best Place is located at the Pabst Brewery with room for over 300 people at any affair they host. There is an outdoor courtyard as well as indoor banquet halls for each part of your event. You can enjoy the luxury of the wedding venue and the blue ribbon beers at this location. For any and every event, this venue has executed the client’s vision flawlessly. Let them help you plan and host your event for a stress-free Wisconsin affair. There are many non-traditional spaces to have your wedding reception, corporate event or even a Quinceanera. 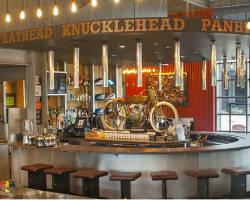 The Harley Davidson Museum provides a fun and modern background for events of any size and nature. The museum, like Harley riders, knows how to have a great party. Reviews from couples who have previously had their reception at this venue say that the celebratory atmosphere and spirit of the location and the amazing staff is infectious and made their event even more special. 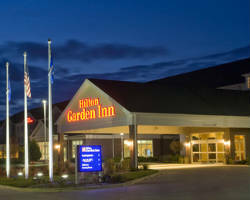 The Hilton Garden Inn is known for hosting the most extravagant weddings both small and large alike. The Grand Ballroom is the perfect location for you and your guests to celebrate the biggest day in your life. This venue is not only the best because of the grandeur of their spaces, but also for the on-site services that are rarely available with other venues. You can stay the night in the hotel; enjoy full planning and decorating services as well as delicious restaurant quality catering. 1451 Renaissance Place has hosted countless traditional weddings and receptions in their beautiful halls. The site offers a historic spirit from the gilded columns to the dark mahogany. This is a perfectly grand wedding venue in Milwaukee, WI. It provides full service, meaning they not only have a beautiful space for you to tie the knot and celebrate, but they also have rooms for the bride and groom to prepare, a kitchen for the caterer and free parking. They have thought of everything you might need. 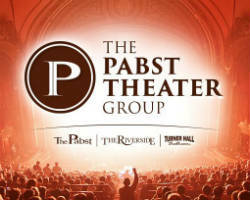 The Pabst Theatre Group offers a unique selection of the best venues in the city. 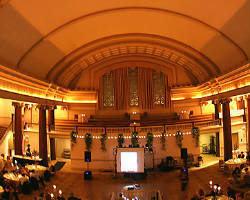 Their main wedding venue, the Turner Hall Ballroom, is the ideal location for a grand wedding affair. With high ceilings and hardwood floors that are perfect for dancing, and a small raised stage that is perfect for the head table, you will have a gorgeous and fun space to celebrate with your large group of family and friends. This historic landmark is beautiful and functional as a wedding reception space. 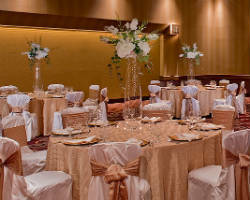 Weddings have always been a staple at the Crowne Plaza Milwaukee. Forget the wedding chapel and outdoor garden wedding venue and opt for something that is sure to be fun and impressive. The elegant ballroom can be easily adapted to your style and your decorations or you can have the on-site wedding coordinator take care of everything. With on-site catering and a beautiful space, you will have everything in one place, and at a relatively cheap price. For a stress-free, lovely wedding day, call them today. Hotels often offer the perfect mix of class and fun to make your event one to remember. That is exactly what is offered by the Hyatt Regency Milwaukee. They have two large ballrooms to choose from as well as a rooftop space and bistro. The rooftop is perfect as a non-traditional wedding chapel with complete views of the city, while the ballrooms are great for a fun reception and the bistro serves as a nice breakfast space the morning after. The Pfister Hotel has been a favorite large and small wedding venue to locals for years. 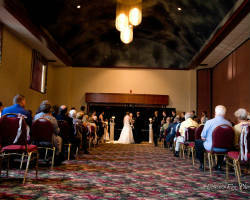 The hotel has elegant ballrooms that are perfect for a wedding reception and ceremony of any size. Whether you are on a tight budget, or would like to spend a bit more, the venue offers planning and catering on site as well as rooms for you and your guests to reserve once you are finished celebrating. The venue strives to make their services affordable for every couple, so call today and begin planning your big day. 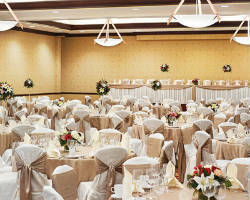 The Italian Conference Center is the perfect party venue or wedding reception hall. This venue can easily be transformed to create an intimate space for you and your guests regardless of the number. The best thing about this Milwaukee wedding venue is that it is flexible. They can provide you with professional staff to help plan and execute your event as well as the equipment to enhance the experience. They also offer home-cooked Italian catering services that everyone will love.